Here, we present a protocol to investigate the host-tissue distribution, transmission mode, and effect on the host fitness of a densovirus within a lepidopteran species, the cotton bollworm. This protocol can also be used for studying the interaction between other orally-transmitted viruses and their insect hosts. 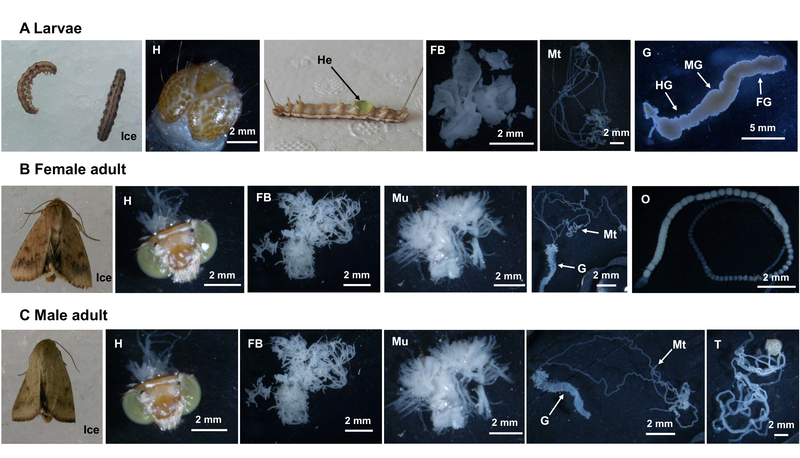 Yang, X., Xu, P., Graham, R. I., Yuan, H., Wu, K. Protocols for Investigating the Host-tissue Distribution, Transmission-mode, and Effect on the Host Fitness of a Densovirus in the Cotton Bollworm. J. Vis. Exp. (122), e55534, doi:10.3791/55534 (2017). Many novel viruses have been discovered in animal hosts using next-generation sequencing technologies. Previously, we reported a mutualistic virus, Helicoverpa armigera densovirus (HaDV2), in a lepidopteran species, the cotton bollworm, Helicoverpa armigera (Hubner). Here, we describe the protocols that are currently used to study the effect of HaDV2 on its host. First, we establish a HaDV2-free cotton bollworm colony from a single breeding pair. Then, we orally inoculate some neonate larval offspring with HaDV2-containing filtered liquid to produce two colonies with the same genetic background: one HaDV2-infected, the other uninfected. A protocol to compare life table parameters (e.g., larval, pupal, and adult periods and fecundity) between the HaDV2-infected and -uninfected individuals is also presented, as are the protocols for determining the host-tissue distribution and transmission efficiency of HaDV2. These protocols would also be suitable for investigating the effects of other orally transmitted viruses on their insect hosts, lepidopteran hosts in particular. In the last few decades, the development of sequencing technology such as next-generation sequencing (NGS) has facilitated the discovery of many novel DNA and RNA viruses, especially nonpathogenic viruses, but also novel isolates of previously known viruses1,2,3,4,5,6,7,8,9,10,11,12. In the model organism Drosophila melanogaster, more than 20 new partial virus genomes have been detected using metagenomic techniques13. Many viral sequences, including novel viruses, have also been identified in other insects, such as honey bees, mosquitoes, Asian citrus psyllids, dragonflies, and multiple lepidopteran species14,15,16,17,18,19,20,21. In the future, it can be expected that more novel viruses will be discovered in insects using these advanced technologies; hence, our understanding of the virus-host interaction may change accordingly6,9. For example, virus-host interactions are considered to be more complicated than previously thought, because many novel viruses are being defined as mutualistic partners rather than strict pathogens22. For example, the mutualistic densovirus DplDNV in Dysaphis plantaginea induces the winged morph and increases mobility, facilitating the dispersal of the host as well as the virus23. Moreover, mutualistic viruses have been described with regards to mammalian health, the drought and cold tolerance of plants, and the impact of bacterial infections24. Seneca valley virus-001 is shown to mediate selective cytotoxicity towards tumor cells with neuroendocrine cancer features25. Hepatitis A virus infections suppress hepatitis C virus replication and may lead to recovery from hepatitis C26. Herpesvirus latency confers symbiotic protection from bacterial infection27. The envelope glycoprotein of human endogenous retrovirus HERV-W induces cellular resistance to spleen necrosis virus28. Curvularia thermal tolerance virus (CThTV) from a fungal endophyte is involved in the mutualistic interaction between this fungus and a tropical panic grass29. Hence, knowledge of the interactions between the newly found viruses and their hosts should generate fresh perspectives on their biology and management. However, the novel viruses, especially the covert viruses displaying no obvious signs typical of acute infection, have seldom been investigated, and we need a pipeline and protocols to investigate the impacts of the newly found viruses on their hosts. Previously, we have reported the prevalence a new monosense densovirus Helicoverpa armigera densovirus (HaDV2) in the cotton bollworm, Helicoverpa armigera, and presented evidence of a mutualistic relationship between HaDV2 and the cotton bollworm30,31. In this paper, we will describe the laboratory protocol to study in detail the interaction between HaDV2 and its cotton bollworm host. The protocol presented here may also be highly relevant to researchers examining the role of other orally-transmitted viruses, especially in lepidopteran pests. Rear cotton bollworm larvae (H. armigera) on an artificial diet32 in a controlled growth room or an artificial climate chamber at 25 ± 1 °C, with 14 h light/10 h dark and 60% relative humidity. Aid single-pair mating of newly eclosed moths by using a plastic cage per pair (10 cm height, 5 cm diameter) covered with cotton gauze to ensure good ventilation and to serve as an oviposition substrate. To increase the likelihood of obtaining a virus-free colony, utilize at least 30 pairs of single-pair matings. Feed adult moths with a 10% sugar and 2% vitamin solution32 soaked on a cotton ball and replenished daily. As female adults lay their eggs on the cotton gauze approximately 2 days post-mating, change the gauze daily. Collect and maintain gauze containing eggs in the same growth room (or artificial climate chamber) as the adult moths until the eggs hatch. Immediately transfer newly hatched larvae to new 24-well plates, with one individual per well. Five days after the first egg-laying date, collect the parent moths and store them in liquid nitrogen. NOTE: Collecting the moths 5 days after the first egg-laying date ensures that the parents are alive at the point of collection and therefore avoids any possible impacts of using dead moths on DNA extraction accuracy. Isolate genomic DNA from these samples using a DNA extraction kit according to the manufacturer's instructions. Amplify a 574-bp fragment of the actin gene with primers actin F/actin R (actin F: 5-CATCTACGAGGGTTACGC-3 and actin R: 5-CATCTGTTGGAAGGTGGA-3). Visualize the polymerase chain reaction (PCR) products using agarose gel electrophoresis according to standard protocols; the successful amplification of the actin gene ensures that the DNA is of good quality. Assess the presence of HaDV2 in the parent moths using PCR with specific primers: DVVPF (GGATTGGCCTGGGAAATGAC) and DVVPR (CGTTGTTTTTATATCCGAGG)31. Once a clean pair has been identified, rear offspring from that single HaDV2-uninfected breeding pair for at least five generations and maintain this as the HaDV2-free colony (NONINF-strain); the HaDV2-infected colony is defined as the INF-strain. To confirm the HaDV2 infection status in the NONINF-strain (and to exclude the effect of known bacteria or viruses on host development), evaluate the infection status for HaDV2, Wolbachia, and H. armigera nucleopolyhedrovirus (HaNPV) in eight randomly selected larvae individuals of the NONINF-strain using PCR (with specific primers: DVVPF/DVVPR for HaDV2, NPVF/NPVR for HaNPV, and 81F/691R for Wolbachia31,33). NOTE: It is known that some viruses could be latent in the infected host, with a level undetectable even when using a PCR-based technique. NGS technologies could be used to confirm that no viral sequences are present in the genomic DNA samples. NOTE: We have shown that the attempted purification of the HaDV2 virus particles inhibits their infectivity and activity31; therefore, the following protocol is performed to achieve the infective HaDV2 solution by filtering the HaDV2-infected individuals. Collect adult moths individually and immediately store them in liquid nitrogen. Completely grind the collected individual moths in liquid nitrogen using a sterilized mortar and pestle. Transfer about 10 µg of debris to a clean 1.5-mL tube. Transfer the remaining debris to a new tube and immediately store them at -80 °C. Extract DNA from the 10 µg of debris, following the protocols provided by the manufacturer. Once the moth DNA has been isolated, check for HaDV2 using the protocol, as described in step 1.6. According to the results obtained in step 2.3, divide the remaining debris into two groups: HaDV2-positive and HaDV2-negative, depending upon their infection status. Add 1 mL of phosphate-buffered saline (PBS; 137 mM NaCl, 2.7 mM KCl, 8 mM Na2HPO4, and 1.5 mM KH2PO4; pH 7.5) to each individual to completely dissolve the remaining larval debris. Centrifuge the homogenate (from step 2.4) at 6,500 × g for 15 min at 4 °C. Filter the liquid supernatant with a 0.22-µm membrane filter. Collect the filtered liquids (200 µL per tube) and immediately store them at -80 °C. NOTE: The 0.22-µm membrane filter will filter out most of the undesirable particulates, bacteria, and fungus. First precool the centrifuge to 4 °C. Perform all protocols involving the operation of filtered liquid on ice to prevent the homogenate from turning brown and coagulating. Generate a HaDV2 standard curve. Amplify the fragments containing primers (VPF: CTGGTGAGGCGATGGACATG; VPR: TGACAAGATCCAGCGTAGACATC) and probe (VP-probe: GCCACCACTAGAGGACCCACCAGATG), which are used for the quantification of HaDV2 virus, with the de novo primers (PF: GGACAATGCTGGTGAGGC; PR: AATCCTCTTTGTCCGTTATCTATG). Use the following program: 30 s at 94 °C, 30 s at 53 °C, and 60 s at 72 °C for 40 cycles on a PCR machine31. Add 1 µL of genomic DNA containing the HaDV2 genome (step 2.3) to the 25-µL PCR reaction as template DNA. Clone the amplified fragments into a cloning vector according to the manufacturer's protocols. Calculate the copy number of plasmids with the following equation: copies/µL = (NA × C) / (n × M × 109), where NA is Avogadro's number (6.02 × 1023 molecules/mol); C is the mass concentration of plasmids (ng/µL), which can be measured using microspectrophotometry; n is the length of recombinant plasmid containing the PCR product (5,195 bp); and M is the molecular weight of an average base pair of double-stranded DNA (660 g/mol). Prepare six 10-fold serial dilutions in 1.5-mL microcentrifuge tubes, with concentrations of 1.5 × 109, 1.5 × 108, 1.5 × 107, 1.5 × 106, 1.5 × 105, and 1.5 × 104 copy number/µL. Perform real-time quantitative polymerase chain reaction (qPCR) using specific primers (VPF/VPR) and a probe (VP-probe) to generate cycle threshold (CT) values of the plasmids described in step 3.1.1.3. Perform three independent technical replicates and average them for further calculations. Using the above results, generate a standard curve correlating log2-transformed HaDV2 concentrations to the related averaged CT values. Quantify HaDV2 in the filtered liquid fluids. Pipet a 100-µL test sample of filtered liquid fluid (step 2.6) containing HaDV2 for DNA extraction. Use real time-qPCR to obtain the CT values for the liquid fluids and compute the copy number using the standard curve in step 3.1.1. Determine the oral infection efficiency with HaDV2-infected filtered liquids of different concentrations. Dilute the liquid fluid containing HaDV2 to the following concentrations: 108, 107, 106, 105, 104, and 0 copy number/µL. Spread the artificial diet evenly on a 9 cm-diameter Petri dish before solidification. Evenly spread HaDV2-containing filtered liquid (200 µL) for each concentration on the surface of the solid artificial diet. Do this in a fume hood. Transfer 100 freshly-hatched larvae to the HaDV2-containing artificial diet in a Petri dish. Gently knock the cotton gauze (including freshly-hatched larvae) to transfer the larvae from the gauze to a sheet of white paper. 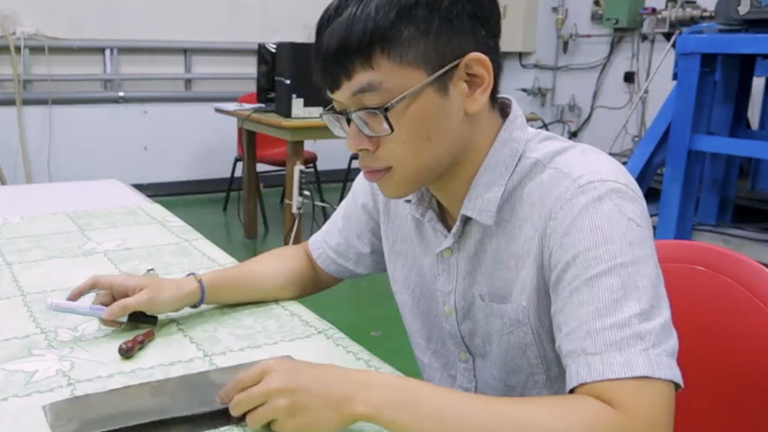 Beat the paper gently so that the larvae spin silk and "balloon" off the paper. Use sterilized forceps to touch the silk and move the larvae to a Petri dish. After 48 h, transfer the larvae on the artificial diet to 24-well plates (one individual per well). Rear the larvae inoculated with HaDV2 at the above concentrations to the adult stage. Collect the adult moths, extract the DNA, and detect HaDV2 using PCR, as described in step 1.5. NOTE: Here, obtain a 100% HaDV2 infection rate of the cotton bollworms using the 108 copy number/µL and thus establish the HaDV2-infected colony (INF-strain). Select adult moths from the NONINF and INF-strains to generate single pairs of ♀-/♂-, ♀+/♂-, ♀-/♂+ and ♀+/♂+ (+: positive for HaDV2 infection; -: negative for HaDV2 infection). Transfer the offspring from the above pairs to virus-free 24-well plates; rear the larvae to the third instar. Extract the DNA from the collected third instar larvae to use as the template to determine the presence of HaDV2, as described in step 1.5. To prevent contamination from viruses and bacteria, sterilize the forceps and scissors in 75% ethanol three times and then heat them in the flame of an alcohol lamp. NOTE: Forceps sterilization is necessary when contamination occurs. Using an analytical balance, weigh the empty tubes that are to be used to store the tissues. Place the larvae and adult moths from the INF-strain on ice for approximately 5 min. Dissect the following tissues under a stereomicroscope in larvae, adult females, and adult males in a clean Petri dish containing PBS buffer. For larvae, pipet hemolymph and dissect the foregut, midgut, hindgut, fat-body, and malpighian tubules (Figure 1A). Immediately transfer each tissue to the tubes in liquid nitrogen. Fix the frozen larvae on cystosepiment using two insect pins (200 µm in diameter, 20 mm in length), inserting into the intersegmental membranes near the head and the last abdomen segment (Figure 1A). Cut the proleg in the posterior abdomen of the larvae so that the larvae hemolymph flows out. Pipette the larval hemolymph within 10 s using a micropipette to prevent browning and coagulating of the hemolymph. NOTE: Phenylthiourea (50 µg/mL) could be mixed at a 1:20 vol/vol ratio with hemolymph to prevent melanization. Using a pair of scissors, make an incision in the cuticle ranging from the last intersegmental membrane to the head. Dissect all the remaining tissues under a stereomicroscope using two forceps; the picture for each tissue is shown in Figure 1A. Mix tissue samples from three individuals together as one replicate. To prevent the contamination of the remaining tissues with the hemolymph during the dissection, wash the dissected tissues in PBS buffer three times. Then, test the HaDV2-infection status of the PBS used for washing. If the final wash buffer is HaDV2-free, the tissue should be clean from contamination with hemolymph. For adult females, dissect the head (brain), muscles, fat-body, gut, malpighian tubules, and ovary (Figure 1B) under a stereomicroscope in PBS buffer. For adult males, dissect the head (brain), muscles, fat-body, gut, malpighian tubules, and testes (Figure 1C) under a stereomicroscope in PBS buffer. Immediately transfer each tissue to the tubes in liquid nitrogen. Using forceps and scissors, remove the wings of the adult moths and wash the remaining body three times to clear the scales. Separate the head, thorax, and abdomen using scissors. Remove the endoskeleton of the thorax and collect the muscle. Using forceps, remove the cuticle of the abdomen and dissect the other tissues following Figures 1B and 1C. Mix the tissue samples from three individuals together as one replicate. Wash the dissected tissues in PBS buffer three times. Weigh the tubes and the above tissues when they have been frozen and ensure that the masses of the different tissues are almost equal. Extract the DNA from these tissues and perform qPCR, as described in step 3.1.2. Calculate the copy number per mg of each tissue using the standard curve generated in step 3.1.1. Use the virus titer per unit mass to correct for the sample bias caused by any difference in the amount of tissue used for DNA extraction. Calculate the percentage of HaDV2 in the specific tissue as follows: percentage of HaDV2 for each tissue = HaDV2 copy number per mg of tested tissue/ (sum of copy number per mg of all tissues). Place at least 100 pupae or newly emerged adult moths derived from the NONINF-strain in a cotton-gauze-covered, 5-L, wire-mesh cage. After 2 days, mated adult females will start to lay eggs on the cotton gauze. Collect and maintain the cotton gauze containing the eggs; the eggs will hatch in about three days. Inoculation of the neonate larvae with HaDV2. Transfer the neonate larvae of the NONINF-strain to the artificial diet containing HaDV2 (108 copy number/µL) to establish the INF-strain. Similarly, transfer neonate larvae to the artificial diet covered with HaDV2-free filtered liquid (step 2.4) to establish the control groups (NONINF-strain). Include at least 240 larvae in each treatment (Figure 2A). NOTE: Larvae that are used to construct the NONINF- and INF-strains are derived from the same parent cohort and hatch at the same time, ensuring the same genetic background. Make sure that the NONINF- and INF-strains are kept in the same climate chamber (at 25 ± 1 °C, with 14 h light/10 h dark and 60% relative humidity) for a synchronous rate of development; the rate can vary depending on temperature and humidity. Handle the delicate larvae gently. After 48 h, transfer the larvae individually to 24-well plates (one individual per well) (Figure 2B). Sequentially number each larva in each well and record the instar stage and survival status daily. About 5 days later, when the artificial diet deteriorates, simultaneously transfer these individuals to a new 24-well plate containing fresh artificial diet (Figure 2C). Weigh the larvae from day 7 to 11 post-hatch using an analytical balance to a precision of 0.0001 g. After weighing, individually return the larvae to the 24-well plate. Upon molting to the fifth instar after the fourth ecdysis (around ten days after hatching), transfer the larvae to glass tubes (10 cm height, 2 cm diameter) (Figure 2D); fifth instar larvae can also be identified by the width of the head capsule (approximately 2.6 mm). NOTE: Transfer the individuals to the glass tube at the same time each day. Code each larva with its original reference number on the glass tube using paint or markers. Record the larval status daily; in the glass tubes, the larvae will pupate after about five days-the pupae stage lasts approximately 11 days. Record the pupae and eclosion date for each individual in the glass tube. Record the mass of 3-day-old pupae. After eclosion, put one female and one male into a single cage with 10% sucrose and 2% vitamin solution (Figure 2E). Replenish the sucrose solution every day. Record the date of death for each moth. When eggs are laid, change the cotton gauze daily. Count the number of eggs immediately. Count newly-hatched offspring while they hatch. During the bioassays, randomly select eight individuals for each treatment to confirm the infection status of HaDV2. Extract the total RNA of these samples using commercial trypsin reagent following the manufacturer's protocol. Synthesize the first-strand cDNA following the manufacturer's protocol and use it as a template to test whether the viruses are successfully transcribed. Progenies from the parents that were HaDV2-free (Figure 3A) were reared as the NONINF-strain. We successfully amplified the actin gene using the same DNA templates, suggesting that the DNA templates were of good quality (Figure 3B). In addition, the randomly selected eight progenies were also free of HaDV2 (Figure 3C), HaNPV (Figure 3D), and Wolbachia (Figure 3E). Again, we concluded that the DNA samples of the progenies were of good quality, because a portion of actin gene was successfully amplified for all tested samples (Figure 3F). 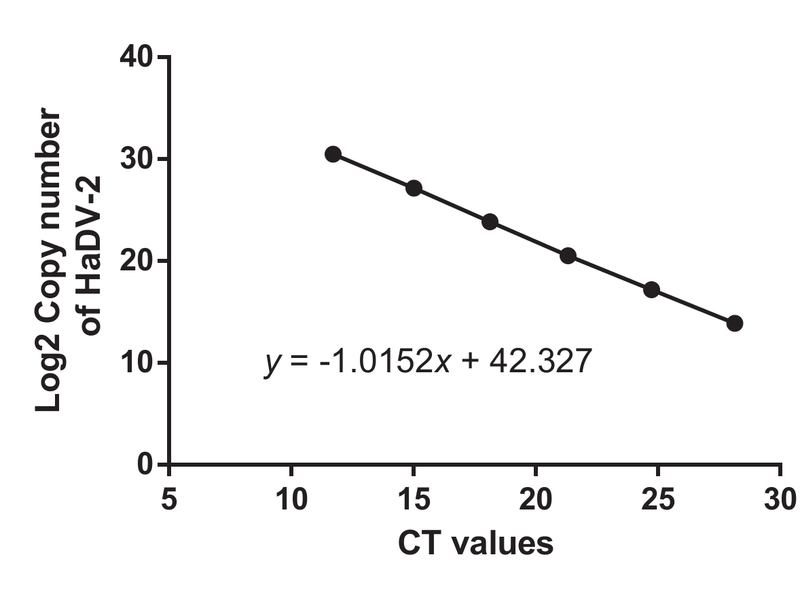 A standard curve defining the relationship between the log of the quality of starting material and the gained CT values was generated, as in Figure 4. A strong linear correlation (R2 > 0.99) was found between the CT values and the log of the initial gene copy number of HaDV2 (Figure 4). Freshly hatched larvae were inoculated with a point standard curve of HaDV2 liquid fluids using 10-fold serial dilutions between 104 and 108 copy number/µL. We obtained a linear correlation between the infection frequency and the concentrations of the HaDV2 liquid fluids; 108 copy number/µL yielded 100% infection for the cotton bollworm, but other concentrations did not (also see Xu et al.31). The HaDV2 infection frequencies of the progenies from the parents with different HaDV2 infection statuses were as follows: 100% for ♀+/♂-, 78% for ♀-/♂+, and 100% for ♀+/♂+ (also see Xu et al.31). To correct for individual differences in the HaDV2 titer, we calculated the HaDV2 copy number per mg of each tissue and the percentage of the total HaDV2 titer for the specific tissue. The results revealed that HaDV2 was mainly distributed in the fat body (Figure 5; also see Xu et al.31). Comparisons of the life table parameters, including the larval periods, pupae periods, adult length, and fecundity, were shown in Table 1 (also see Xu et al.31). The larval and pupal masses were as published by Xu et al.31. The HaDV2 infection statuses in both the NONINF-strain and the INF-strain were determined by PCR (results published by Xu et al.31). Figure 1. Dissected Tissues for (A) Larvae, (B) a Female Adult, and (C) a Male Adult. H, head (brain); He, hemolymph; FB, fat body; Mt, Malpighian tubules; G, gut; FG, foregut; MG, midgut; HG, hindgut; Mu, muscles; O, ovary; T, testis. Please click here to view a larger version of this figure. Figure 2. Bioassay Procedure to Determine the Effects of HaDV2 on the Cotton Bollworm. (A) Inoculation of the freshly hatched larvae with HaDV2. (B) The transfer of the HaDV2-infected and HaDV2-free individuals to 24-well plates after 48 h. (C) Different sizes of HaDV2-infected and -free individuals. (D) Transfer of fifth-instar larvae to new glass tubes (10 cm height, 2 cm diameter). (E) The placement of one female and one male moth into the same cage to determine adult longevity, egg production, and hatch rate. Please click here to view a larger version of this figure. Figure 3. Infection Status for HaDV2, HaNPV, or Wolbachia in HaDV2-infected and HaDV2-free Colonies. HaDV2 infection status in the female and male parents (A). 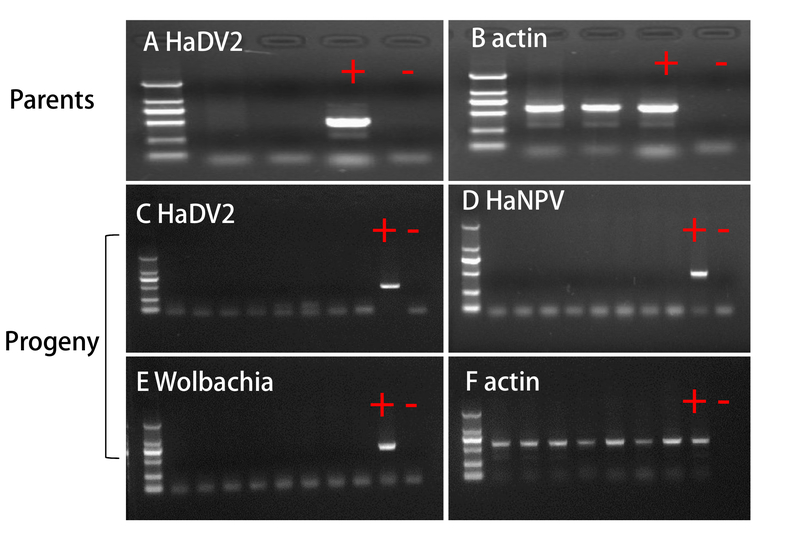 Infection status of HaDV2 (C), HaNPV (D), and Wolbachia (E) in the randomly selected progenies. To check the quality of genomic DNA, the housekeeping gene actin was also amplified for the parents (B) and progenies (F). Lane M shows the DL2000 marker (2,000 bp, 1,000 bp, 750 bp, 500 bp, 250 bp, and 100 bp). Lane 1: female parent. Lane 2: male parent. Lane 3 - 10: progenies. Please click here to view a larger version of this figure. Figure 4. The Standard Curve Correlating Log 2-transformed HaDV2 Concentrations to Cycle Threshold (CT) Values. Please click here to view a larger version of this figure. Figure 5. Host-tissue Distribution of HaDV2 in Larvae (A), Adult Female (B), and Adult Male (C) Cotton Bollworms. Percentage (%) = the ratio of HaDV2 in different tissues (per mg), as described in step 4.7 The data were analyzed statistically using analysis of variance (ANOVA) and Tukey's test (larvae: n = 7; adult males: n = 6; adult females: n = 6). Means ± SE. Results were published by Xu et al.31. Please click here to view a larger version of this figure. Table 1. Life-history Parameters for HaDV2+ and HaDV2-cotton Bollworms. Student's t-test is used to determine the level of significance. Means ± SE are shown. Data presented in this table were published by Xu et al.31. In the last few decades, most studies on insect-virus interactions have focused on honey bee health34,35,36, vectors of human disease37, plant viruses38, and some insect pathogenic viruses that have great potential as biological control agents39. Little attention has been paid to covert viruses in insects, especially in lepidopteran pests. Here, we present a protocol for the study of the interactions between a covert virus and its host insect. A comparison of the life table parameters for virus-infected and virus-free host individuals should ideally exclude any effect of differences in host genetic background. To study the viral phenotype, many previous studies have compared the life table parameters of either naturally infected or uninfected individuals in the same colony or individuals inoculated by microinjection, but this effort is time consuming23,40. 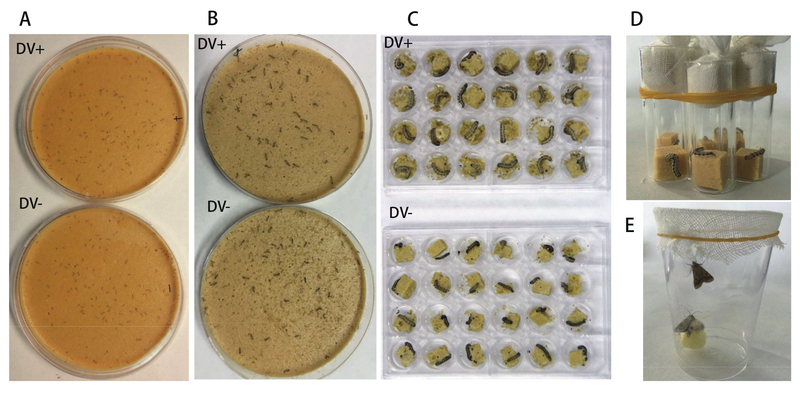 The oral inoculation of cotton bollworms with HaDV2, described here, serves as a simple and effective means to analyze viral phenotypes. This procedure also ensures the same genetic background for HaDV2-infected and HaDV2-uninfected colonies. Virus inoculum can be prepared in many ways. The purification of virus particles using high-speed centrifugation inhibits virus infectivity, resulting in low infectivity; hence, virus-containing filtered liquid was used to infect the cotton bollworm larvae31. The fact that the 0.22-µm membrane can filter out most fungal and bacterial particles from HaDV2-containing filtered liquid and that the HaDV2-free filtered liquid was used as the control might exclude the effect of other viruses on our results. However, we cannot exclude the possibility that the bioassay results could also be biased by undiscovered viruses. Hence, HaDV2 particles with high infectivity should ideally be purified in the future to obtain robust results. The virus concentration positively correlated with virus infectivity; hence, we were interested in determining the HaDV2 concentration that will yield 100% infection. Our results showed that the 108 copy number/µL could be used for the virus inoculation to obtain this infection rate. Undoubtedly, the correlation between virus titer and infection rate should be studied for other virus-host interactions studied in the future. In addition, the virus titer of each individual in the field should also be explored. Hence, we could then simulate the effect of viruses upon individuals in the field. The gentle handling of the delicate larvae during the first few days after they hatch is very important, because they are easily fatally damaged. Moreover, the HaDV2-uninfected colony should be kept separately in the greenhouse to prevent HaDV2 contamination-the infection rate of HaDV2 has been found to be very high, both in the field and in the laboratory31. This work was supported by the National Key Basic Research Program of China (No. 2013CB127602) and the Science Fund for Creative Research Groups of the National Science Foundation of China (No. 31321004). 24-well plate Corning 07-200-740 Multiple suppliers available. DNA extraction kit TIANGEN DP304-03 Multiple suppliers available. vitamin complex Multiple suppliers available. Tang, P., Chiu, C. Metagenomics for the discovery of novel human viruses. Future Microbiol. 5, 177-189 (2010). Rosario, K., Breitbart, M. Exploring the viral world through metagenomics. Curr. Opin. Virol. 1, 289-297 (2011). Hugenholtz, P., Tyson, G. W. Microbiology - metagenomics. Nature. 455, 481-483 (2008). Kristensen, D. M., Mushegian, A. R., Dolja, V. V., Koonin, E. V. New dimensions of the virus world discovered through metagenomics. Trends Microbiol. 18, 11-19 (2010). Kleiner, M., Hooper, L. V., Duerkop, B. A. Evaluation of methods to purify virus-like particles for metagenomic sequencing of intestinal viromes. BMC Genomics. 16, 7 (2015). Ho, T., Tzanetakis, I. E. Development of a virus detection and discovery pipeline using next generation sequencing. Virology. 471, 54-60 (2014). Marx, C. J. Can you sequence ecology? Metagenomics of adaptive diversification. PLoS Biol. 11, e1001487 (2013). Radford, A. D., et al. Application of next-generation sequencing technologies in virology. J. Gen. Virol. 93, 1853-1868 (2012). Liu, S. J., Chen, Y. T., Bonning, B. C. RNA virus discovery in insects. Curr. Opin. Insect Sci. 8, 54-61 (2015). Mokili, J. L., Rohwer, F., Dutilh, B. E. Metagenomics and future perspectives in virus discovery. Curr. Opin. Virol. 2, 63-77 (2012). Liu, S. J., Vijayendran, D., Bonning, B. C. Next generation sequencing technologies for insect virus discovery. Viruses-Basel. 3, 1849-1869 (2011). Cook, S., et al. Novel virus discovery and genome reconstruction from field RNA samples reveals highly divergent viruses in Dipteran hosts. PLoS ONE. 8, e80720 (2013). Webster, C. L., et al. The discovery, distribution, and evolution of viruses associated with Drosophila melanogaster. PLoS Biol. 13, e1002210 (2015). Granberg, F., et al. Metagenomic detection of viral pathogens in spanish honeybees: co-infection by aphid lethal paralysis, israel acute paralysis and lake sinai viruses. PLoS ONE. 8, e57459 (2013). Runckel, C., et al. Temporal analysis of the honey bee microbiome reveals four novel viruses and seasonal prevalence of known viruses, Nosema, and Crithidia. PLoS ONE. 6, 20656 (2011). Cox-Foster, D. L., et al. A metagenomic survey of microbes in honey bee colony collapse disorder. Science. 318, 283-287 (2007). Chandler, J. A., Liu, R. M., Bennett, S. N. RNA shotgun metagenomic sequencing of northern California (USA) mosquitoes uncovers viruses, bacteria, and fungi. Front. Microbiol. 6, 185 (2015). Shi, C. Y., et al. A metagenomic survey of viral abundance and diversity in mosquitoes from Hubei province. PLoS ONE. 10, e0129845 (2015). Nouri, S., Salem, N., Nigg, J. C., Falk, B. W. Diverse array of new viral sequences identified in worldwide populations of the Asian citrus psyllid (Diaphorina citri) using viral metagenomics. J. Virol. 90, 2434-2445 (2016). Dayaram, A., et al. Identification of diverse circular single-stranded DNA viruses in adult dragonflies and damselflies (Insecta Odonata) of Arizona and Oklahoma, USA. Infect. Genet. Evol. 30, 278-287 (2015). Jakubowska, A. K., et al. Simultaneous occurrence of covert infections with small RNA viruses in the lepidopteran Spodoptera exigua. J.Invert. Pathol. 121, 56-63 (2014). Roossinck, M. J. Move over, Bacteria! Viruses make their mark as mutualistic microbial symbionts. J. Virol. 89, 6532-6535 (2015). Ryabov, E. V., Keane, G., Naish, N., Evered, C., Winstanley, D. Densovirus induces winged morphs in asexual clones of the rosy apple aphid, Dysaphis plantaginea. Proc. Natl. Acad. Sci. USA. 106, 8465-8470 (2009). Roossinck, M. J. The good viruses: viral mutualistic symbioses. Nat. Rev. Microbiol. 9, 99-108 (2011). Venkataraman, S., et al. Structure of seneca valley virus-001: an oncolytic picornavirus representing a new genus. Structure. 16, 1555-1561 (2008). Deterding, K., et al. Hepatitis a virus infection suppresses hepatitis c virus replication and may lead to clearance of hcv. J. Hepatol. 45, 770-778 (2007). Barton, E. S., et al. Herpesvirus latency confers symbiotic protection from bacterial infection. Nature. 447, 326-329 (2007). Ponferrada, V. G., Mauck, B. S., Wooley, D. P. The envelope glycoprotein of human endogenous retrovirus herv-w induces cellular resistance to spleen necrosis virus. Arch. Virol. 148, 659-675 (2003). Márquez, L. M., Redman, R. S., Rodriguez, R. J., Roossinck, M. J. A virus in a fungus in a plant: three-way symbiosis required for thermal tolerance. Science. 315, 513-515 (2007). Xu, P. J., et al. Complete genome sequence of a monosense densovirus infecting the cotton bollworm, Helicoverpa armigera. J. Virol. 86, 10909-10909 (2012). Xu, P. J., Liu, Y. Q., Graham, R. I., Wilson, K., Wu, K. M. Densovirus is a mutualistic symbiont of a global crop pest (Helicoverpa armigera) and protects against a baculovirus and Bt biopesticide. PLoS Pathog. 10, e1004490 (2014). Liang, G. M., Tan, W. J., Guo, Y. Y. An improvement in the technique of artiﬁcial rearing cotton bollworm. Plant Protec. 25, 15-17 (1999). Zhou, W. G., Rousset, F., O'Neill, S. Phylogeny and PCR-based classification of Wolbachia strains using wsp gene sequences. P. Roy. Soc. B-Biol. Sci. 265, 509-515 (1998). Mondet, F., de Miranda, J. R., Kretzschmar, A., Le Conte, Y., Mercer, A. R. On the front line: quantitative virus dynamics in honeybee (Apis mellifera L.) colonies along a new expansion front of the parasite Varroa destructor. PLoS Pathog. 10, e1004323 (2014). Chen, Y. P., et al. Israeli acute paralysis virus: epidemiology, pathogenesis and implications for honey bee health. PLoS Pathog. 10, e1004261 (2014). Hunter, W., et al. Large-scale field application of RNAi technology reducing israeli acute paralysis virus disease in honey bees (Apis mellifera, Hymenoptera: Apidae). PLoS Pathog. 6, e1001160 (2010). Halstead, S. B. Dengue virus - mosquito interactions. Annu. Rev. Entomol. 53, 273-291 (2008). Whitfield, A. E., Falk, B. W., Rotenberg, D. Insect vector-mediated transmission of plant viruses. Virology. 479-480, 278-289 (2015). Moscardi, F. Assessment of the application of baculoviruses for control of Lepidoptera. Annu. Rev. Entomol. 44, 257-289 (1999). Szelei, J., et al. Susceptibility of North-American and European crickets to Acheta domesticus densovirus (AdDNV) and associated epizootics. J. Invert. Pathol. 106, 394-399 (2011).